Illustration courtesy of Slumberjack, Inc.
Jim admitted: "I cannot begin to count the number of times that I wanted to take my Slumberjack sleeping bag with me on stand in Colorado to keep warm. Heck, I even thought about cutting arm holes in it and chopping off the bottom, so I could walk around. However, I was not willing to sacrifice my best mountain bag. I just piled on more layers of clothing, fired up the hand warmers and accepted the fact that I would eventually get cold while on stand." At first glance, the Thermal Cloak looks like an oversized sleeping bag, but it isn't. It is an incredibly well designed outer garment that will keep you warm during cold or wet weather. In fact, in our tests here in New Mexico during the spring turkey season, it also served as a personal blind that moved when we had to move. For the record, the spring turkey season in the Rockies of our state is cold. It may be warm down in the flatlands, but up high we get all kinds of nasty weather. Wind, rain, snow and hail, take your pick. It is almost like hunting during the fall deer season. Our experience this spring was quite severe and relevant to the effectiveness of the Thermal Cloak. Every hunter knows that, sooner or later, when sitting in a blind or hunkered down behind a bush or tree, you get "cold soaked." Thermal packs help, but we never really get warmed up once the cold sets in. This is why, when we used the Thermal Cloak, it was such a pleasure. The Cloak kept both the cold and wind out. In fact, we almost dozed off a couple of times, that is how comfortable we were. When you look at the initial picture of the Cloak on the website it appears to be nothing more than a modified military mummy sack. Nothing could be further from the truth, except that it is warmer than a mummy sack with the head-to-toe 160 gram insulation. 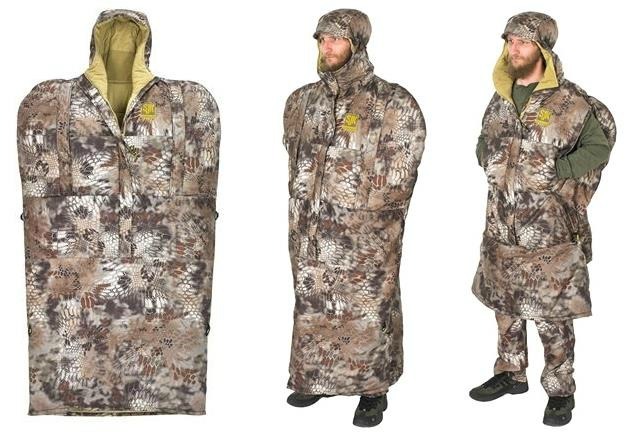 There are a lot of little extras on the thermal cloak that make it a very good buy for hunters and outdoorsmen. The quiet fabrics are waterproof and the seams are taped to ensure proper sealing to keep out the weather. The arm holes have magnetic closures that keep you warm while on stand, yet permit a very silent opening when you need to shoot or move about. The open foot design at the bottom is not only a safety feature to insure that you don't trip, but allows one to move about quickly when needed. The built-in toggles allow you to cinch up the bottom for greater mobility. The design of the fleece collar and hood retains your peripheral vision and hearing and lies flat for shooting. This is a major plus, as the hoods on most jackets and parkas are obnoxious and interfere with shooting. We found an additional benefit of the Highlander Thermal Cloak: it rolls up compactly and fits into our SJK Flush Lumbar Daypack. This makes it very easy to carry the Cloak up the mountains to our hunting area and back out, without risking it getting damaged in the process. In case you don't have a daypack, SJK has included a compression stuff sack with the Cloak. There is ample room under the Cloak for insulated outerwear, such as your regular jacket. There are front pockets for hand warmers in case you are a person that gets really cold. The 32 inch, heavy-duty (#8) zipper in the front is very handy for . . . well, if you are a guy, you get the idea. Our only regret is that the Cloak was not available thirty years ago. It provides excellent protection from the elements, while functioning as a personal blind. It will keep you warm during those quiet moments on stand. Unless you live in the tropics, this is an essential piece of equipment for anyone who wants to stay warm out in the boondocks. The MSRP of $199.95 is not an excessive price to pay for the security and comfort afforded by the Thermal Cloak. Addendum: No, Jim didn't get a turkey, but he stayed warm!